No rest for the wicked: T3 marine sector rumbles into life…..
Leaving the Celtic Sea and the delights of the Celtic Deep, noon on Sunday 27th July, the Royal Research Ship (RRS) James Cook homed in on Britice-Chrono Transect 3 and the delights of the Irish Sea. For me work levels already high increased, with Transect leader duties to fulfil, and the challenges of finding till – glacimarine mud contacts throughout the sector, and do not forget the shells/fossils for the critical dating targets. That said without Katrien’s (van Landeghem) constant input and support it would have been ridiculous, the work in advance of the cruise identifying targets and new locations drew on considerable effort and collaboration focused on this marine sector of T3 over the past 2-3 years. The success of the efforts for T3 obviously relied on the excellent work effort, diligence and company of the cruise team, science crew, BGS and NOC Piston coring teams and the RRS James Cook captain and crew, all whom did everything they could to help us. Not singling people out, but I thank Katrien for constant input, advice and support as co-leader on this transect and Colm as Science Lead on JC106 cruise. In the Celtic Sea, the ship was home to the friendly academic interplay between James and Daniel, the Irish Sea also offered up a number of longer standing and perhaps more vociferous historical debates! Understanding and interpretation of the nature and extent of glacimarine conditions in the Irish Sea basin has ebbed and flowed for 4-5 decades, with some proponents holding for a full glacimarine ice margin, others subaqueous margins with more restricted access to the ocean and the other end member glacilacustrine basins separated from the sea. For all these views a comprehensive borehole and geophysical survey targeting environments across the sea floor had the potential to advance understanding, but for Britice-Chrono we clearly needed glacimarine conditions and sediments to provide the marine shells and microorganisms that we can radiocarbon date to gain a chronology for retreat of ice from the basin. Marine fossils have been recovered from coastal glacigenic sediment sequences surrounding the Irish Sea for centuries, but debate continues over whether they are in situ or derived, eroded from the sea floor, during ice advance and then redeposited in glacial sediment. If in situ they offer the potential to constrain retreat of ice margins and the development of glacimarine conditions, if derived they cannot really advance our dating control. Some challenging fieldwork and some painstaking analysis of the fossils and microfossils lies ahead. 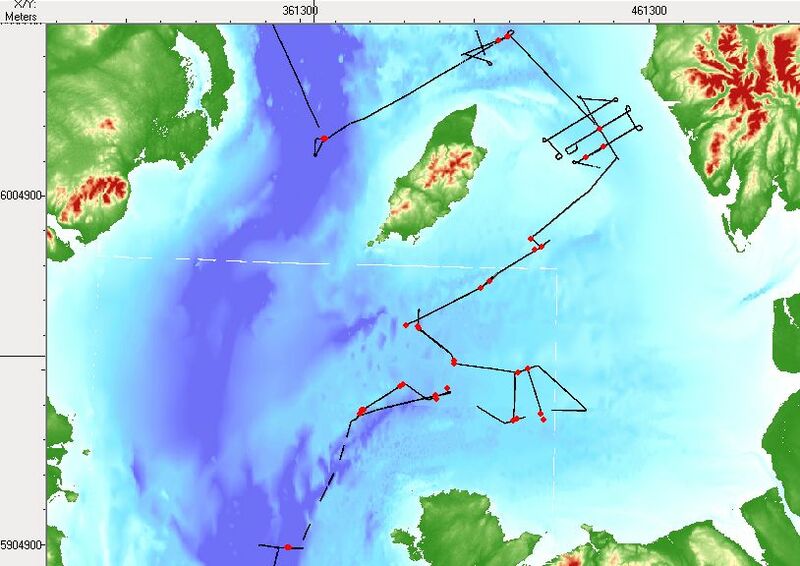 Our journey from the Celtic Deep ~ 51°25’N to our first survey and core sites west of Anglesey around 53°15’N took just over 12 hours at a steady ~10 knots. Our first sites, a bit of a late addition and product of general brain-storming, were ~ 13-14 miles west of Holyhead and targeted the deep waters of northern extensions of St Georges Channel. The location kind of bridges T4 and T3, and we wanted some indication of deglaciation of the deep waters between Holyhead and Dublin. On reflection I was not sure what to expect here, but we had planned a sub-bottom profiler SBP and multibeam survey line as an initial exploration, but circumstances and our temperamental SBP conspired against us. The multibeam data on the other hand were excellent, it was a decent trough 2 miles wide 30-40m deep and we used the multibeam to avoid surface sand waves. Our aims were to avoid surface sand and access the underlying laminated glacimarine units, 2.5 hours and two vibrocores later, some success >3m of mud ending in reddish (an Irish Sea glacial signature!) stiff muds. These laminated or bedded sediments hopefully were lain down under marine conditions fronting the ice sheet as the ice margin retreated to higher ground east and north between Anglesey and the Isle of Man. 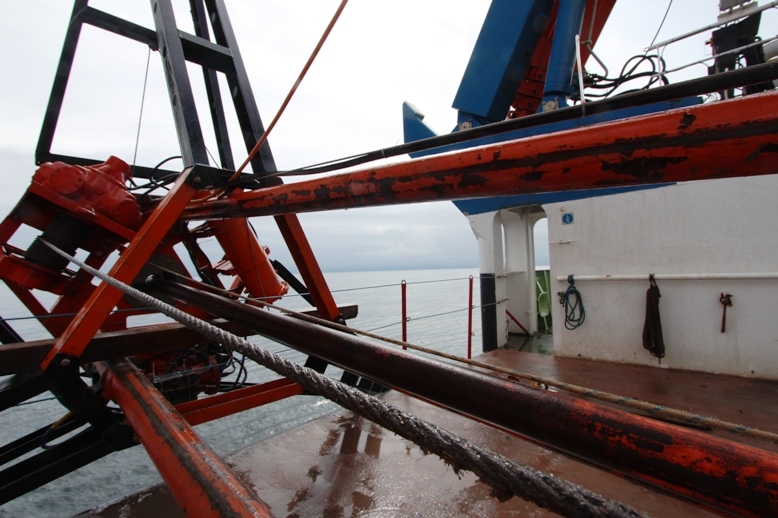 From noon 28th July we moved east and north between the Isle of Man and North Wales, and into a region a large part for me where my interest in this research started, working for and collaborating with Geoff Thomas on sections and sediment all around the Irish Sea. In the deeper waters between the Isle of Man and North Wales, our multibeam data gave us a view onto a very well preserved glacial landscape of drumlins and flutes, moulded elongate low hills shaped by the passage of ice. Uncovered as ice melted and then preserved beneath water probably ever since, their summits are grooved with markings probably formed by ice-bergs calving from and then grounding on the landform surface fronting this glacier. Guided by the multibeam sea floor topography and our shallow geophysical data we targeted hollows in the landscape with shallow fills of sediment overlying the glacial surface. Our vibrocorer can penetrate to ~5-6m depending on the sediments, absence of large cobbles or bedrock, heavy seas and luck. Fingers were regularly crossed and the only wooden items in the all metal BGS vibrocorer cabin are now getting quite worn by us touching them for luck and the right sediments. Broadly we divided the Irish Sea basin into four sub areas, 1. South of a line between the Isle of Man and Barrow-in-Furness completed by 21.30 on 30th July, the deeper waters between the Isle of Man and western Cumbria by 18.30 on 31st July, the Solway Firth (between the Isle of Man and Scotland) by 5am 1st August and finally the deep waters west of the Isle of Man by 11.30am 1st August. >500km of survey line, 34 cores in total, almost all of them reaching the reddish glacimarine muds often laminated some with dropstones and in many cores stiff diamicts with clasts typical in character of Irish Sea glacial tills seen in coastal cliff sections around the basin. We had the sediment contexts we desired, the subglacial to ‘glacimarine’ transition and water-lain ice marginal muds from settings across the transect. The nature of this water-body and answers to the Britice-Chrono geochronological questions must wait on many months of laboratory analysis, but I left the Irish Sea northwards for the Malin Sea and T7, satisfied and with the feeling that the sediments and geophysics alone will fill in a significant and long standing gap in our understanding of the last glaciation of the Irish Sea. This entry was posted in Marine geology specific issues and tagged briticechrono, fieldwork, geophysics, glaciation, Irish Sea, lacustrine, Marine, multibeam, RRS James Cook, sampling, T3, transect 3 on August 3, 2014 by briticechrono. 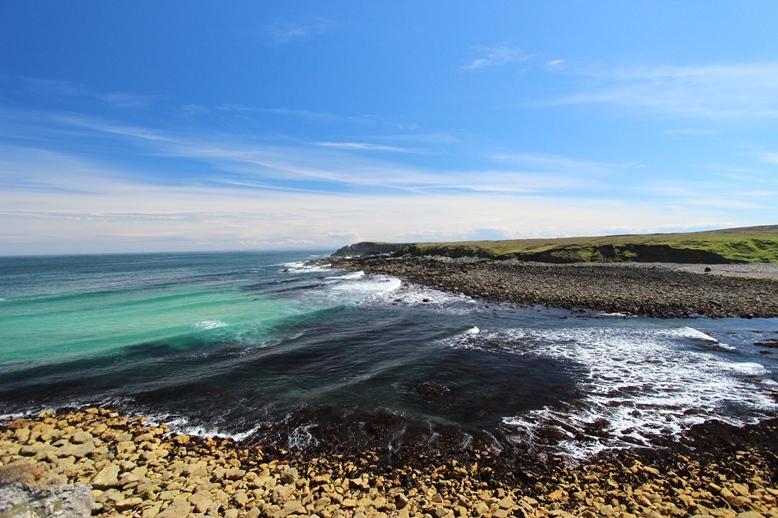 Concerning Unst, it is a delightful island in the northeast of Shetland, and the peace and quiet was interrupted the last two days by a team of geoscientists hunting for treasure. In this case treasure would be boulders or sediments that would allow the dating of ice margin retreat across northeast Shetland. We set off from Lerwick around 8 am armed with tools of the trade; rock saw, hammers, ground penetrating radar (GPR), percussion corer, RTK dGPS and a film crew. Getting to Unst required driving to a short 30 mins ferry crossing from Toft on mainland to Ulsta on the island Yell. Our time on Yell was brief with views of the rugged peat covered island on the journey from Ulsta to the next ferry terminal at Gutcher (north Yell) suggesting little prospect of glacially transported boulders. Hopefully Unst would deliver the goods! Following the Yell to Unst crossing, also brief (20 mins), we were ready to explore. We journeyed about as far north as you can drive on Unst to Herma Ness in the northeast, here hopefully our targets would provide the most northerly of our Shetland grid of sites. To cover the ground we divided into two teams: OSL and sediment group (Rich, Matt, Chris, Vince and Saskia) and Rock gatherers (Derek, David and Tom). For one of us (Rich), the plan for finding sediments involved following the footsteps of a predecessor at the University of Liverpool, geologist Derek Flinn who published extensively on the glaciation and glacial geology of Shetland in the 1970-90’s. An article on ‘The Milldale Glacial Lake, Herma Ness, Unst’ by Derek Flinn appeared in The Shetland Naturalist in 1992. 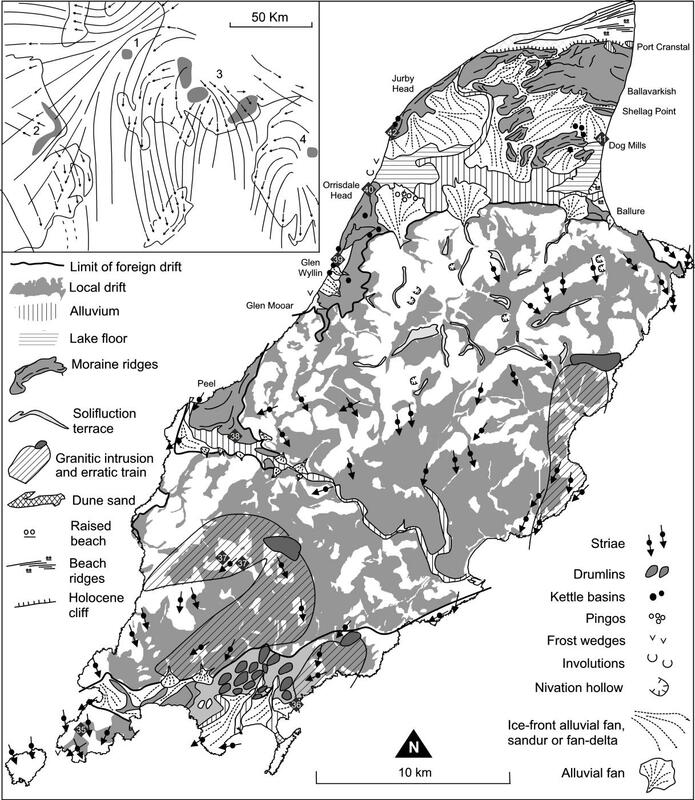 Part of the mapping by Flinn identified an enigmatic outwash fan raised above (70-110m OD) the valley floor on the west flank of Burra Firth valley. The attraction for us lay in the potential for glaciolacustrine deposits to include sands for that elusive deglacial outwash material. Matt and Rich hiked up Milldale Burn and examined numerous exposures on the left bank that showed 3-4 m of sandy diamict, but no outwash. Meanwhile Chris explored the feeder outwash channels and confirmed an inflow feeding the deposit from the south. Our plans to run GPR survey were sabotaged by the Holocene, a very annoying 3 m of undulating and hagged peatland. All in all not a great success (except for some TLC for a new-born lamb by Chris), and then we abandoned the feature as, probably an outwash fan but composed of materials coarser and problematic for sampling. We then explored the other end of the Loch of Cliff and there are other bench like features also suggesting the presence of a former glacial lake but no sign of the sediments. Disheartened, we investigated other possible sections for glacigenic material in Norwick and Bray of Skaw, but the only prospect on the north margin of the sandy beach at Bray of Skaw we later revised interpretation of coarse cobble gravels to that of a storm beach buried by interbedded wind-blown sand and peat. For the team searching for rocks, the day was exhilarating and slightly frustrating, exploring the stunning landscape of Herma Ness walking from the car park at Cleva Ness to the tip of the headland north of Hermaness Hill, the far northeast of Unst and Shetland, overlooking the remote offshore rocks of Muckle Flugga. A great circular walk, but the entire area was covered with peat, and little sign of bedrock or boulders, notwithstanding the promising bedrock lithologys. Thus no evidence of glacial activity, in the form of sculpted bedrock, erratics, pseudoerratics or striations, was found. The team drew a blank in the northeast on the headlands of Skaw. Hill of Clibberswick though covered with bedrock exposures sadly there was no clear evidence of glaciation, no boulders and the bedrock was ultramafic metagabbro. Even though not promising a sample was taken for possible cosmogenic nuclide dating using the 36Cl isotope. Day 2, after an excellent breakfast and a detour to debate the beach deposits at Bray of Skaw, we continued the search for boulders starting at Keen of Hamar walking through extensive exposure of Serpentinite and Britain’s largest chromite mine, at the coastal cliffs, we finally discovered that elusive evidence for glacial activity we had been searching for a glacial diamict that buried the Serpentinite showing glacially smoothed and scoured surfaces, these striations testifying to erosion by ice. Sadly the slopes littered with debris from the mining offered no prospects for cosmogenic nuclide dating. Finding bedrock: returning to the extensive north-south valley containing the Loch of Cliff, we explored the hills around Hargal Burn examining bedrock ridges and erratic boulders marked on the BGS geology sheets. Though not completely ideal, the rock team sampled the stoss and lee side of roche moutonnee form composed of psammite. We then followed up the wisdom received in the pub the night before on our journey back to the ferry in the south of Unst. Sure enough on the Westing Road, many boulders were visible, and a short journey west, 100 m distance from the Standing Stone south of the road we found a series of psammite boulders potentially moved by ice and containing good quartz veins. So after a shaky start we were ready to leave with 7/8 samples promising cosmogenic nuclides from the northernmost target of our sampling campaign. 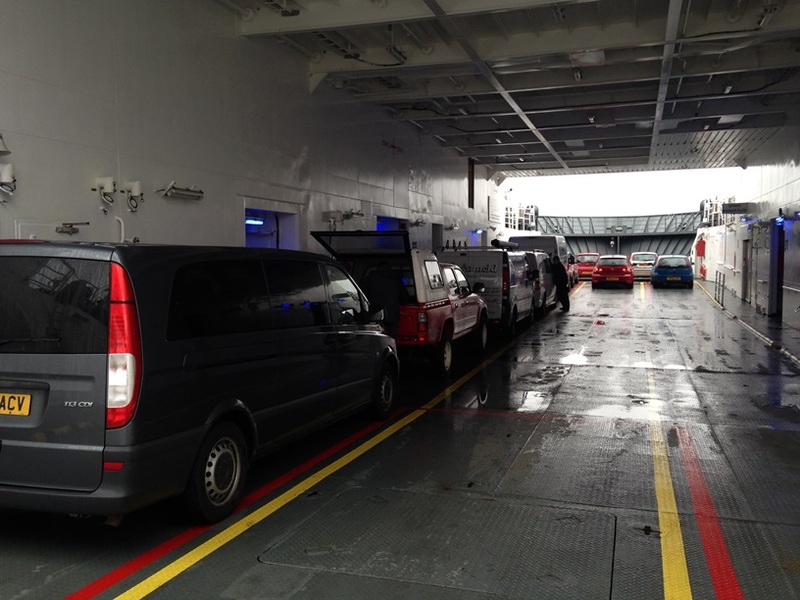 The return home went like clockwork, catching both of the return ferries promptly and all for excellent value, £54 for two cars and eight people return travel! We left Unst at 17:55 and made it to the excellent fish and chips shop/restaurant in Brae by 19:00, and what a feast awaited. The second best Fish and Chips in the United Kingdom, Frankies, battered scallops, pan fried scallops, mussels in blue cheese, ham and garlic, battered haddock, sea food tagliatelle and smoked haddock fish cakes, this place is off the scale, exceptional we cannot recommend it more highly. The team tired, satisfied, happy and ultimately successful returned to our digs near Lerwick for some much needed rest. Tomorrow waits with further sampling planned and our sampling grid beginning to fill……. This entry was posted in Terrestrial geology specific issues, Uncategorized and tagged briticechrono, CN dating, fieldwork, geochronology, lacustrine, T1 transect on May 11, 2014 by briticechrono.